With the NBA Finals upon us, it seems appropriate to take up my continuing series of Executive Deposition Tips with this bit of advice: control the tempo. If you’re being deposed, you’re running out the shot clock. 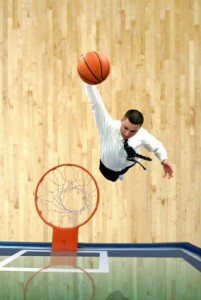 The opposing counsel, on the other hand, is doing the fast break, run-and-gun offense, trying to put you on edge. Don’t let him. In order to properly answer the question, you have to think about the question, and you can’t do that if you let the opposing counsel rush you. And he wants you to feel rushed, so that that you’re not really thinking about each question before you answer it. Sometimes, the witness is in such a hurry to get the deposition over that the witness himself actually tries to speed up the pace. Other times, the witness speeds things up out of anger or frustration. This is always a bad idea. There is no clock ticking out the seconds until the buzzer ends the game. Within reason, you can take as long as you want or need to formulate a cogent, well thought-out answer. That simple truth can be easy to forget in the heat of a deposition—and it can get hot in there. As an attorney, I’m always there to advise my client on legal matters, of course, but very often my most important job is to remind her to relax and take her time. I do that before the deposition and during every break, and I also make sure that whenever I speak, I’m using the tone and tempo I want her to use in her answers. Two other ways to slow down a deposition: air and water. Air in the form of slow, deep breaths. Of course, you can’t be too dramatic in the middle of a deposition, but making sure that you’re always breathing, slowly and deeply, is a very effective way of staying calm. The physiological effects of deep breathing are undeniable, and you can’t help but be at least somewhat relaxed when you’re filling your body with plenty of oxygen. As to the water, always, always, always have a glass of water on hand. Pausing to take a drink of water is a great way to slow things down. One word of caution: if you’re so nervous that your hands are shaking, don’t use this tip. Any advantage you’ve gained by slowing down the deposition you’ve lost by showing your fear in the form of shaking hands. Remember: the other side in a deposition wants to throw you off and make you blow the game. Your job is to ignore LeBron James and make the best shot you possibly can. This entry was posted in Depositions, Legal, Litigation and tagged depositions, LeBron James, litigation, NBA Finals. Bookmark the permalink.